The new BMW Series 5 sedans offer state-of-the art technology, attractive design, and an extraordinary dose of the joy of driving. THIS SPACIOUS 4.84 meter-long sedan stands out with its characteristic, markedly dynamic lines, as well as with its lighter body construction, which takes advantage of unique technology that combines aluminum and steel elements. The decreased weight is also attributed to the all-aluminum construction of the front and rear suspension, and the chassis, besides coming with a range of safety systems (ABS, ASC, DSC, DTC), can also be fitted with the Dynamic Drive active stabilization kit, which allows a merging of marked sportscar handling with prime comfort for passengers. Another innovation is a programmable heads-up display that is projected on the windshield, showing information on the vehicle’s operation, including navigation. Safety is greatly enhanced by the separation of controls – driving functions are concentrated on the steering wheel and surrounding area, while the convenient, compact iDrive control is placed on the central panel. 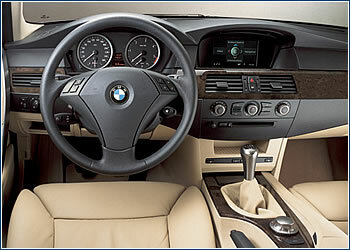 The basic model, costing CZK 1,181,300, is the BMW 520i sedan, 2.2-l, 170 hp (125 kW), gasoline engine, mated to a direct-geared six-speed transmission, and its top speed is 230 km/h. 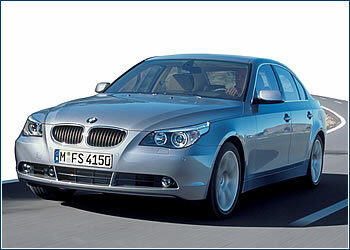 The 3.0-l, six-cylinder BMW 530i and 530d models both sell for CZK 1,392,000 – the former has a gasoline engine that turns out 231 hp (170 kW), and the latter has a Common Rail turbo-diesel engine tuned to 218 hp (160 kW). They are also available with six-speed Steptronic automatic transmissions for CZK 1,448,000.